See just how well FINAL FANTASY XIV will run on your computer. 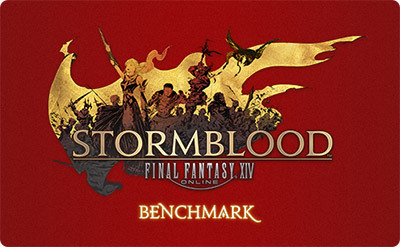 This official benchmark software uses actual maps and playable characters to assign a score to your PC and rate its performance. A character creation tool is also included, allowing you to view a playable character as they will appear in-game. In addition to the standard 1280x720 pixel display, the benchmark also supports a 1920x1080 high definition display. Enjoy every crisp detail of the gorgeous realm of Eorzea. High-quality surround sound completes the experience, wrapping players in the stirring music and the atmospheric effects of FINAL FANTASY XIV. Features Japanese, English, German, and French. Please use NVIDIA drivers 350.12 WHQL or later when using SLI, or AMD drivers 13.9 or later when using CrossFire. - This software is not a trial version. Please be aware that you cannot play FINAL FANTASY XIV using this software. - You must read and agree to the terms and conditions before downloading the software. Click on the download link below, agree to the Software License Agreement, and download the file. Uncompress the downloaded file and specify a destination to save the unzipped files. 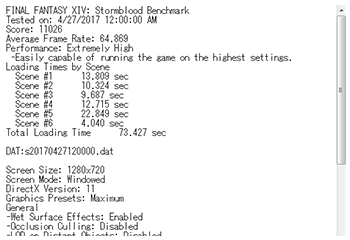 Execute the uncompressed file – ffxiv-stormblood-bench.exe. Select the language to display, read through the Software License Agreement, and use the software. * The 64-bit version of the above mentioned operating systems is required. * This benchmark is not available on Mac OS. Graphics card and drivers compatible with DirectX® 11. * If you receive one of the following error messages, your DirectX Library may be out of date. Please follow the link below to download and install the latest DirectX End-User Runtime. Executing the ffxiv-stormblood-bench.exe file will bring up a splash page, followed by the Software License Agreement window. * If your PC does not fulfill the system requirements to run the benchmark, the program will close. A notification will prompt you to adjust screen resolution or other settings if necessary. 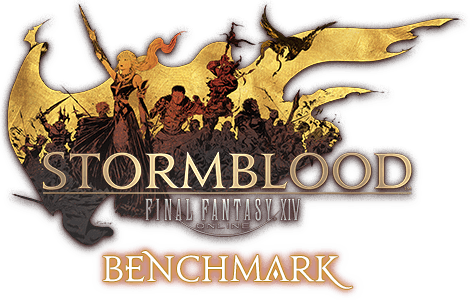 Please review the aforementioned FINAL FANTASY XIV: Stormblood Official Benchmark Software Overview to determine whether your PC fulfills the system requirements. You can change language settings at the upper-right corner of the window. The language selected will be used in the benchmark launcher window and the benchmark score display. By default, the agreement window will appear every time you launch this software. Check this box and click the Agree button if you wish to skip this window and jump directly to the benchmark launcher the next time you use the software. Read the Software License Agreement. If you agree to all the terms and conditions, click the Agree button. 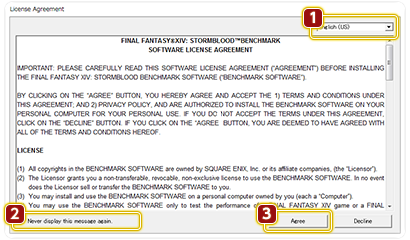 Once you accept the terms of the Software License Agreement, a launcher window for the benchmark will appear. Here you can adjust various settings for the cutscenes used to measure system performance. Displays your most recent benchmark score along with a timestamp. Visit the official FINAL FANTASY XIV: Stormblood site. Download the free trial version of FINAL FANTASY XIV. Scores can be posted on the Lodestone or on social networking sites. You may use the provided text, or revise it to your liking. The cutscenes must play in their entirety and generate a score for this feature to be available. Displays system specifications including your version of Windows, CPU, and GPU. Also displays the graphics and resolution settings to be used upon starting the benchmark. The language setting can be changed for both the launcher window and the cutscene overlay. This setting is shared with the Software License Agreement window. Characters created via the character creation tool can be selected to appear in benchmark cutscenes. Check this box to see cutscenes play in a loop. The cutscenes will play back only once by default. * If set to repeat, the maximum framerate will be limited to 60FPS in order to reduce stress on your system. You can end playback at any time by clicking X or pressing the ESC key. Please note that you will not receive a score when looping playback. Creates a report containing your score and system specifications. The report will be saved as a txt file in the same folder as the "ffxiv-stormblood-bench.exe". The Software License Agreement will be displayed once again. If you chose not to show the agreement on startup, you may review it again here. Change the graphics settings at which you would like to benchmark your system. Five graphics presets are available: Maximum, High (Desktop), High (Laptop), Standard (Desktop), and Standard (Laptop). Selecting "Save as Preset" will allow you to save up to three custom graphics settings. You can also include a comment when saving preset settings, which will display as a description to the left of the dropdown menu. Players who have already installed FINAL FANTASY XIV may choose to import their graphics settings. After selecting "Import My Settings," the "My Settings" option will appear in the preset dropdown menu. Selecting "Default" will restore all default settings and delete all saved presets. Three monitor resolutions are available: 1024x768, 1280x720, and 1920x1080. Other resolution options may be available depending on your monitor. High graphics and resolution settings will place more stress on your system. Start cutscene playback and measure your system's performance. * The cutscenes are approximately 7 minutes in length. Results will not be displayed if playback is stopped before completion. Visit the official Nvidia site. During the cutscenes, you can view your score, the specifications of your system, and a frame rate performance graph. Indicates fluctuations in frame rate. Higher graph lines indicate a higher frame rate. Displays system specifications including your version of Windows, CPU, and GPU. Displays current benchmark score. Increases based on the performance of your system. When the cutscenes end, the launcher will reappear and display your benchmark results. Your system will receive one of eight ratings depending on your score. Please refer to the table at the bottom of this page for further details. Total loading time between all cutscenes. This benchmark will not only gauge your computer's performance running FINAL FANTASY XIV, but also allow you to use the game's character creation tool. Appearance data can be saved for use creating characters in the retail version. You may choose to have your character appear in place of the default Hyur male monk or samurai in the benchmark cutscenes. 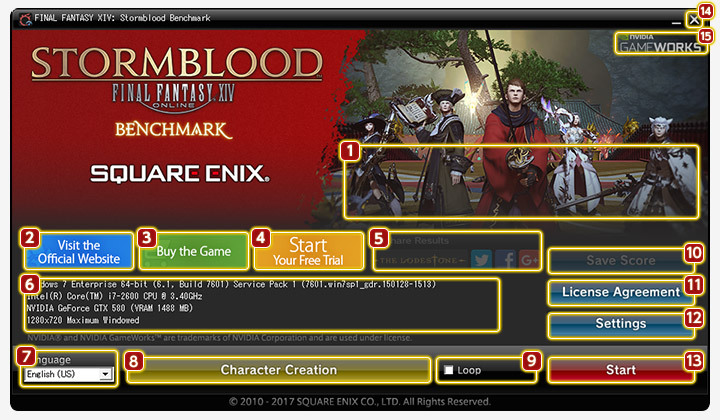 * This benchmark and included character creation tool can be used without a Square Enix account or a connection to the game's servers. * Data from the character creation tool will be saved to the following folder: My Games/FINAL FANTASY XIV - A Realm Reborn (Benchmark). * Use of Au Ra characters in the retail version requires the installation of FINAL FANTASY XIV: Heavensward, FINAL FANTASY XIV: Stormblood, or FINAL FANTASY XIV Online. Furthermore, the platform on which they will be used must have a registered license for FINAL FANTASY XIV: Heavensward or FINAL FANTASY XIV: Stormblood. Character appearance data saved using this benchmark software can only be used on the PC on which the Windows version has been installed. You may choose to have a character appear in place of the default Midlander male monk or samurai in the benchmark cutscenes. You can include a comment when saving character data in the benchmark. Click to launch the character creation tool. Select from 24 sets of gear for your character. * Gear cannot be changed when selecting the premade Midlander male. Click to select the character you wish to use. Click to return to the launcher without changing settings. When launching the character creation tool, you may choose to create a new character or load existing character data. This data can also be loaded from the benchmarks for FINAL FANTASY XIV: A Realm Reborn and FINAL FANTASY XIV: Heavensward, as well as the beta and retail versions of the game. Begin creating your character by selecting a race, gender, and clan. You will then be given the option to customize appearance. You may return to an earlier step of the creation process at any time. When your character is ready, a save prompt will appear. Select Yes if you wish to save appearance data, then specify a location. Data for up to 40 characters may be saved, and can be selected to be used during cutscene playback at the main character selection screen. Starting the benchmark will cause several cutscenes to play. 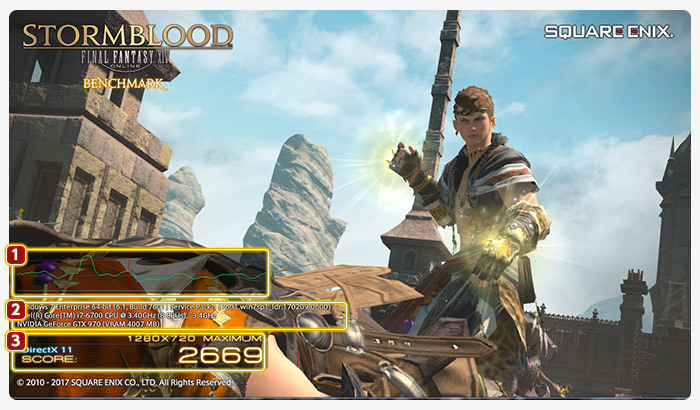 Once the cutscenes have completed, a score will be displayed. 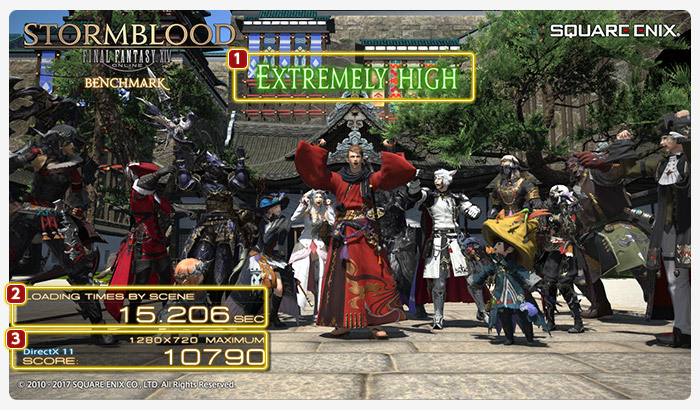 The score represents how well FINAL FANTASY XIV is estimated to run on your PC. Please use the explanations of the scores outlined below for reference. Easily capable of running the game on the highest settings. Easily capable of running the game. Should perform exceptionally well, even at higher resolutions. Easily capable of running the game. Should perform well, even at higher resolutions. Capable of running the game on default settings. Consider switching to a higher resolution depending on performance. Capable of running the game on default settings. Capable of running the game, but will experience slowdown. Adjusting settings may improve performance. Capable of running the game, but will experience considerable slowdown. Adjusting settings is unlikely to improve performance. Does not meet specifications for running the game. * Please note that the score does not guarantee that your system will run FINAL FANTASY XIV. Please use it for reference only. * The benchmark software for FFXIV: A Realm Reborn released in 2013 was designed to generate scores based primarily on frame rate. However, the newer benchmarks have been redesigned to generate scores based on your system's overall performance. We strongly recommend using the latest benchmark software to more accurately measure the performance of your PC. The FINAL FANTASY XIV: Stormblood benchmark cannot be run on 32-bit operating systems. The FINAL FANTASY XIV: Stormblood benchmark can only be run on a 64-bit Windows operating system.